Today I made some gluten-free rice krispie treats in the shape of pumpkins and thought I’d share them with all of you! I saw a cute picture on facebook of some apple-shaped rice krispie treats and thought it would be fun to make a pumpkin patch. 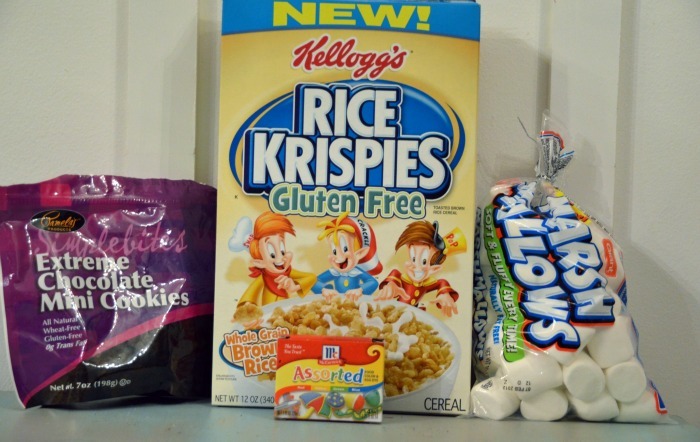 **Updated 2015: Unfortunately Kellog’s discontinued their gluten free version of Rice Krispies cereal. Frosting for leaves is powdered sugar, green food coloring, and a little milk (or water). To make, all you need to do is follow the rice krispies treats recipe on the back of the box. When your marshmallows are nice and melty add red and yellow purchased or homemade food coloring until you reach a pumpkin orange color. After you stir the cereal into the marshmallow mixture, rub some butter on the palms of your hands and roll the mixture quickly into balls. I placed more butter on my hands between rolling each ball. 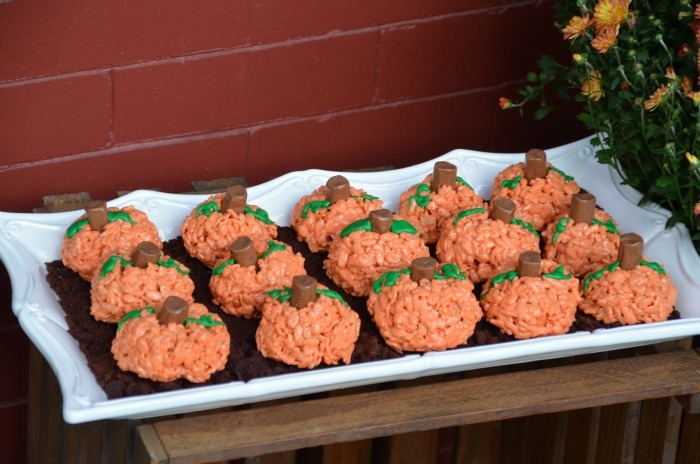 Place a tootsie roll in the center of each pumpkin and garnish with frosting leaves. I placed my pumpkins on a bed of crushed chocolate cookies just for fun and then styled them for you all. These would be adorable for a harvest party! And in case you are wondering, they come Darth Vader approved! I’m honestly not sure since peanuts aren’t an issue for us. Malt O Meal has a crispy rice that is gluten free. Found this from Pinterest and they are so cute! Just thought that I would note that Rice Krispies are no longer Gluten Free!! How many pumpkins does the regular recipe for rice krispy’s make? Hi Lucinda, good question. I’m pretty sure I did the single recipe for these pumpkins. It of course depends on how large you make your treats but I would guess around 15 small pumpkins. These are adorable and I think I will try it! Also, my 4 year old is Darth Vader as well!!! My friend Amy shared this recipe on her Facebook page and I thought it was the perfect idea to use as favors for my nephew’s 2nd Halloween themed Birthday party next weekend. I made a “test batch” today and they turned out perfect! My Tip is to use “mini” Reece’s Pieces peanut butter cups instead of tootsie rolls for the stems. I know this is not a good idea if someone has a peanut allergy but it looked so much more like a stem and it stuck on nicely too! I made these last night and was a little disappointed how quickly they fell apart after putting them on the pan. Should I have waited longer before forming them into the pumpkin? So darn adorable!!! I’m so craving rice krispies treats now:D Pinning them! Just this morning I found two boxes of rice krispies in the back of my cupboard. I decided I would make some treats for my husband to take to work and I wanted to make them Halloween-ish but I did not have any Halloween sprinkles that I thought I did. And then low and behold I stumble across this…problem solved! So going to make these! 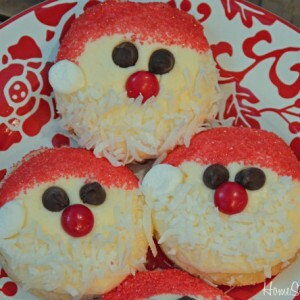 I featured your yummy treats over at Lemon Drop Life! These are so cute! I love fun rice krispies recipes. Thanks for sharing! 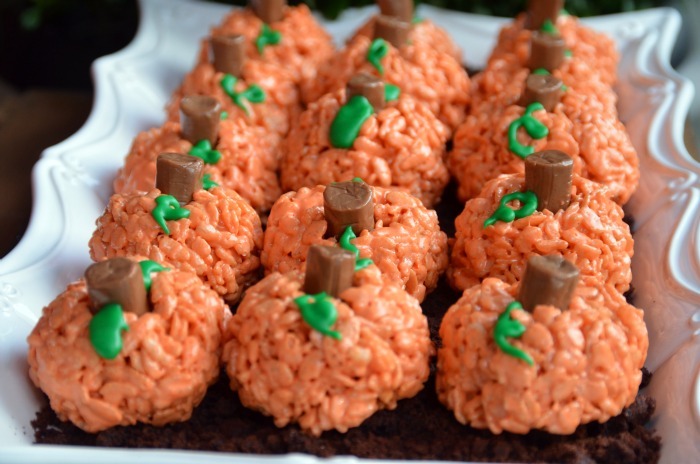 Rice Krispie treats are my favorite and these are so cute, Beth! I love the idea of the “dirt’:) Thanks for sharing…I will be making these! Oh, my goodness. These are so cute. One of my favorite things about fall is pumpkins. I can’t wait for our next get together, I am so making these cuties to take. 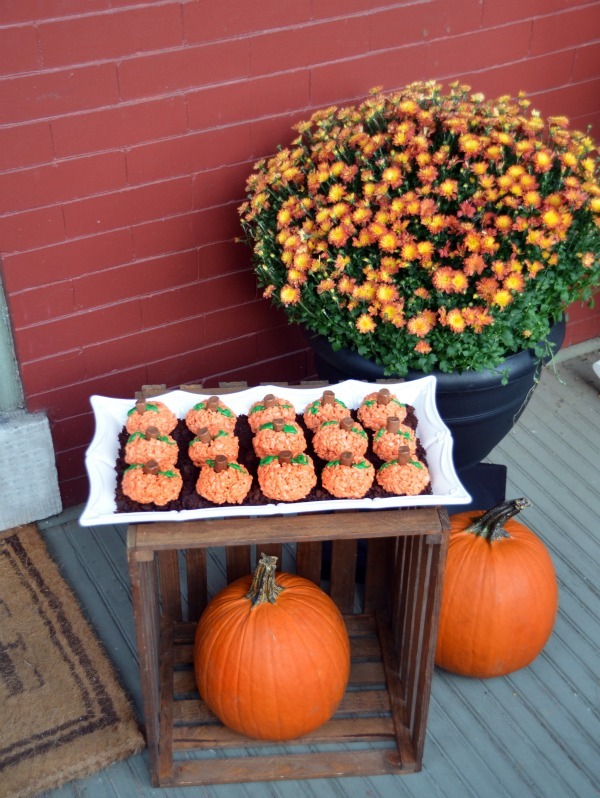 Thanks for sharing this fun fall idea. Cutest things I have ever seen! I am soooooo making these!! Love your adorable, tasty pumpkin patch! LOVE, LOVE THIS IDEA!!! 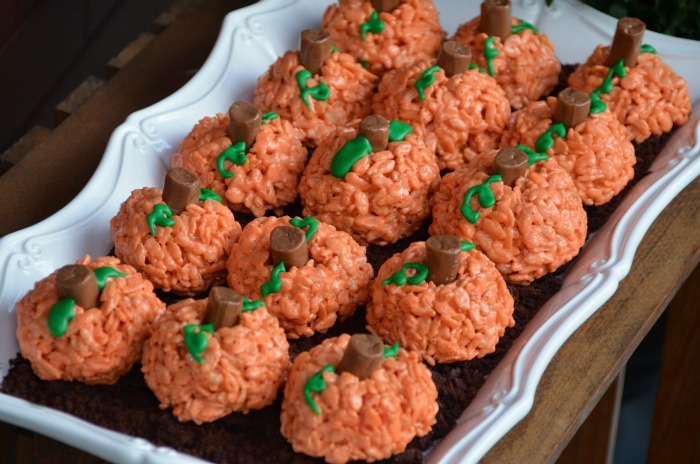 You had me at rice krispie, LOL:) I am making these for sure!!!! Love this idea! I’ve been trying to come up with ideas for what to make for SB’s class party, and these are perfect! Thanks for sharing. Thanks for sharing! I love finding things I can eat. Can you tell me if there is anything different between the Rice Crispies that say Gluten free and the regular ones (I haven’t seen the gluten free ones before)? I’m pretty sure the regular ones should be gluten free so I’m wondering if they are just letting people know right on the front that they are gluten free or if they are doing something different in the ingredients… Thanks! Unfortunately, a lot of seemingly gluten free cereals still contain malt barley which has gluten in it. If it doesn’t have “gluten free” on the box then check the ingredients carefully to see if it’s hiding in there. It usually is. I think all Rice & Corn Chex cereals are now gluten free and Coca Pebbles is safe too but the rest are not typically “safe”. Pinning these! They are awesome, cute, adorable, perfect! These are absolutely adorable and so easy. Can’t wait to make for all of the kids class parties. Hey Beth! 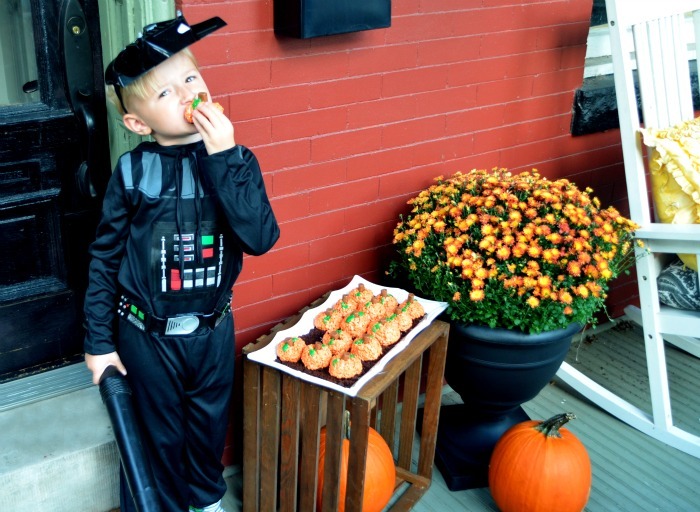 My little Darth Vader nephew looks adorable! I think I’ll make these for your little nephew’s preschool class party next month! Too cute (AND EASY!!!! )and they gobble them up! How fun are these? I am going to make these with my grandson age 6. He loves to cook with me, especially when we make cookies! Thanks for sharing! Oh my goodness! I love these! It is always so hard to find something gluten free that is FUN for my 2 boys that are GF! I’m definitely going to have to make these for them for school! Thank you!!!! I love these…can’t wait to make these….I’m gluten free so these are perfect!!!! Those are too cute! Thanks for sharing the recipe! My girls are super excited to make these! Soo adorable! 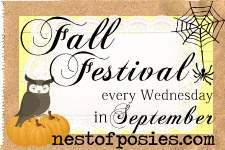 I’m working on a fall post for tomorrow or Tuesday and would love to post about this with a link to you, with your permission. Let me know. Beth your photos look magazine perfect. I love your cute trick or treater. I can’t wait to make these. It’s just a shame I’ll end up eating them all by myself with Grandkids living out of state and Neil not much of a sweet eater. Thanks for sharing. I’m bookmarking this one!